While the world is still recovering from the latest episode of dramatic economic meltdown and I was just away for a mere short period of four months, the tiny island country was blooming and developing like never before! Yes, I was referring to my homeland - Singapore. Just over a period of four months, there were already three new shopping centres - Ion Orchard, Orchard Central & 313 @ Somerset - added to the shopping scene along Orchard Road. At Little India, there's the much anticipated eco-friendly City Square Mall - a definite first in Singapore. And then there's Iluma at Bugis. And for sure, there'll be more sprouting out like crazy mushrooms in the months to come. Question: And what do these new shopping malls have in common to the many existing ones? Answer: The numerous familiar brands of clothings, accessories, restaurants, supermarkets, pharmacies etc. 就如换汤不焕药. 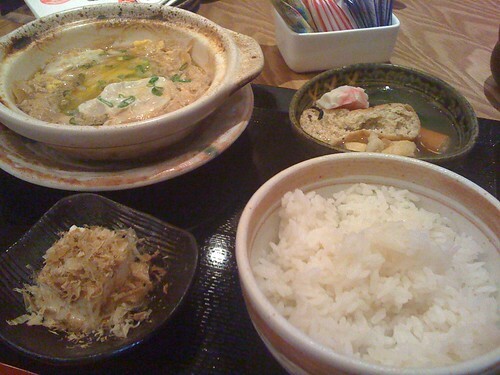 * Ebisboshi @ Ilumna - a Japanese-themed restaurant very much like the Shokudo Japanese Food Bazaar and Marché but at a much smaller scale. 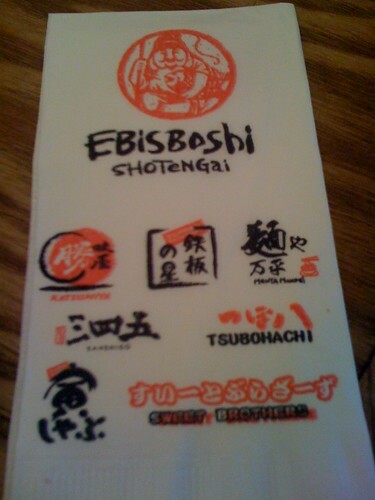 The visit to Ebisboshi was brought about after watching a recommendation of the restaurant by a local food program. I would have to admit that I was a little disappointed upon arriving at the restaurant. It was not as big as what I thought it would be from the television program and it doesn't help that there were only a few customers filling the tables. In any case, we decided to give it a try and were about to order only the finger foods when we were instead presented with a thick menu comprising of all the dishes from the various stores. This is different from Shokudo or Marché which requires the customers to order and collect the food at the respective food stores with all bills charged to a chip card. And I must say our appetites opened up instantly while we were excitedly flipping through the colourful menu. The selections were so vast that we couldn't decide what to order! And the price was relatively cheaper compared to Shokudo or Marché. 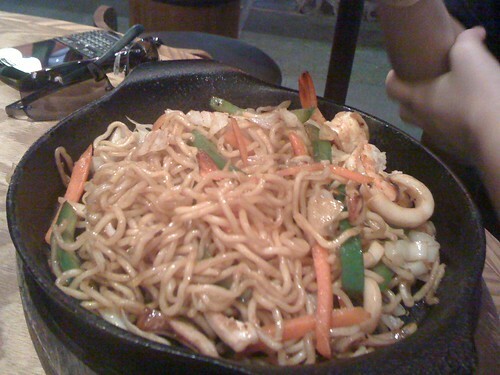 Seafood fried noodles in tomato sauce - extremely appetising(超开胃!) and my friend ended up having to order another plate of sushi!